Crisp and fragrant, mildly sweet and the color of liquid sunshine, the lemon liqueur known as limoncello is a simple combination of lemons, sugar and alcohol, but its intense citrus flavor makes it so much more than a sum of its parts. Native to Italy’s South, where it is enjoyed as a postprandial digestif, limoncello has been popular in the citrus-growing regions along Italy’s Amalfi coast for more than a century. Commercial brands are easy to find, but for a fresher-tasting liqueur, a homemade limoncello is well worth the effort. This recipe from Katie Parla’s latest book, Food of the Italian South, is inspired by how they made limoncello at a now defunct Brooklyn-based Italian restaurant called Franny’s, where they suspended the lemons in cheesecloth. This allows the alcohol to absorb the citrus aromas by osmosis and makes for a cleaner final product, Parla says in the book, adding that she uses Everclear instead of vodka per the traditional Sorrento style. This recipe makes enough for 8 cups and takes about five weeks to prepare. Place the alcohol and lemon zest in a large glass jar. 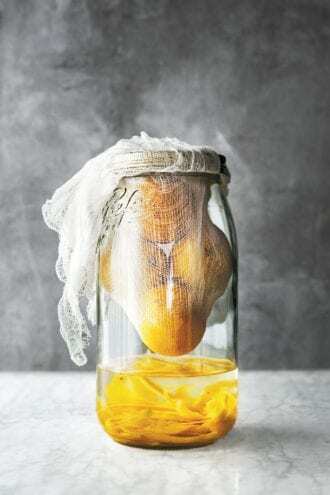 Using cheesecloth, suspend the five whole lemons (not the zested ones) in the jar above the alcohol, taking care not to let them touch the liquid. Seal the jar and let rest in a cool, dark place for 30 days. Agitate the jar every few days. On the last day, combine the water and sugar in a large saucepan and heat over medium-high heat. Meanwhile, strain the infused alcohol into a clean jar, discarding the zest and lemons. When the sugar has dissolved, 3 to 5 minutes, remove the pan from the heat and allow the syrup to cool, about 20 minutes. Add three-quarters of the syrup to the jar with the alcohol. Taste and adjust the sweetness, adding more syrup as needed. Seal the jar and allow the liquid to rest in a dark place at room temperature for 1 week. Note: Since the lemon zest is the main flavoring ingredient here, only use untreated organic lemons. You can substitute mandarins, bitter oranges, or any other citrus for the lemons—just be sure they’re organic and untreated, too. Reprinted with permission from Food of the Italian South: Recipes for Classic, Disappearing, and Lost Dishes, by Katie Parla. 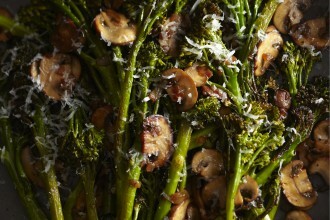 A hearty splash of wine makes this veggie-rich side dish sing.